Masala Mexicana is an original collection of delicious recipes inspired by the fusion of Mexican and Indian cuisines. Masala Mexicana Masala Mexicana is an original collection of delicious recipes inspired by the fusion of Mexican and Indian cuisines. Never miss a new Masala Mexicana recipe! Sign up with your email address to receive yummy news and updates. 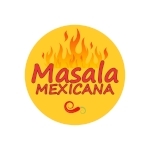 The photos in this website were taken by and are property of the Masala Mexicana team (unless otherwise noted). Feel free to pin or reference, but please do not use our photos without reference or permission. Unauthorized use and/or duplication of this material without express and written permission from this blog’s author and/or owner is strictly prohibited. Excerpts and links may be used, provided that full and clear credit is given to Masala Mexicana with appropriate and specific direction to the original content.